One of the many challenges facing U.S. immersion schools is the issue of attrition and its impact at the district, school, and classroom level. Although some amount of student withdrawal is a natural phenomenon in public schooling, American educator Stover (2000) emphatically states that “research has made it clear that bouncing from school to school, classroom to classroom, hurts children’s academic progress” (p. 61). In other words, long-term schooling experience in one setting benefits learners. In immersion programs, attrition rates can have an additional negative impact. Since best practice recommends that newcomers entering after grade one be able to demonstrate a certain level of bilingualism and biliteracy, immersion learners that leave the program are difficult to replace. To date, research on immersion education in the U.S. has largely ignored this topic. However, a number of research studies examining attrition in Canadian French immersion schools point to seemingly high attrition rates, certain studies reporting between 40-50% at the elementary level alone (Stern,1991; Kamin, 1981; Morrison, Pauley, & Bonyun, 1979; Halsall, 1989). Do U.S. immersion schools experience a similar decline in student population during the elementary years? How effective are U.S. immersion programs at providing students a sustained, K-6 learning experience? 1. What are the attrition rates as determined by the relative percentage of students who leave the program at each grade level for each of four Midwest elementary immersion programs for the academic years between 1991-1992 and 2001-2002? 2. How do these rates compare with the corresponding district-wide attrition rates for elementary schools? 3. How do these rates compare with the attrition rates of one demographically similar, same-district elementary school? 4. Have the attrition rates for each school over the ten-year period remained stable, increased or decreased as each program has established itself? 5. Are there specific grade levels during which student transfers to a non-immersion program are more likely to occur? Student withdrawal data were gathered on four elementary immersion schools (see Table 1 for School Profiles) for a ten-year period (1992-1993 – 2001-2002). The participant schools all represent the same metropolitan area located in the Midwest. This study reviewed three main types of transfer data: 1) mid-year transfer rates, 2) total withdrawal rates, and 3) mobility rates. Data on the rate of mid-year transfers came from the state database and refer to students transferring out of the elementary school between Oct. 1st and June 1st of the academic year. Total withdrawal rates were determined using site-based information (yearbooks, school directories and databases) and refer to students transferring out of the immersion elementary school during the school year or the summer immediately following. Mobility rates were taken from district-maintained databases and refer to the rate of students enrolling in and/or leaving a school during the academic year. Sub-question #1: How do mid-year transfer/mobility rates for immersion schools compare with the corresponding district-wide rates for non-immersion elementary schools? Annual mid-year transfer rates for individual immersion programs were reported as relative percentages based on the total number of students for each year in which data were available. These rates were then averaged across the ten -year period of time for each immersion school and compared to the average transfer rate for all same-district, non-immersion elementary schools. Overall, in both urban and suburban districts, the elementary immersion schools had lower mid-year transfer or mobility rates when compared to the district average for elementary schools that were not immersion. In New Palz Urban Schools, Anderson Spanish Immersion School’s mobility index was notably lower (4-5%) than the district average for elementary schools (18-22%) for the three years beginning in 2000-2001 (data were unavailable prior to the 2000 – 2001 school year). 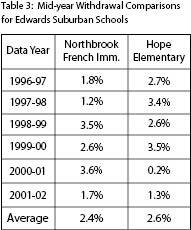 In the Edwards Suburban School District, the elementary average (not including Northbrook French Immersion) of mid-year transfer rates across six years was 3.7%, whereas the average mid-year transfer rate for Northbrook French Immersion during those same years was 2.4%. Pearl Spanish Immersion School in the Lanesville Suburban District, the youngest of the four immersion schools, first became a K-6 elementary site in the 2002 –2003 school year. Thus, comparison between this immersion program and the district’s non-immersion schools was only possible for this one year. 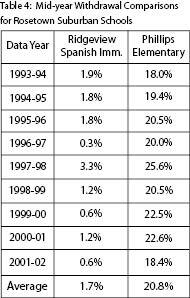 In the 2002 – 2003 school year, Pearl Spanish Immersion’s mid-year transfer rate was 1% while the other five Lanesville elementary elementary schools reported an average mid-year transfer rate of 10.9%, nearly 10 percentage points higher. In Rosetown Suburban Schools, data were available for a period of eight consecutive years. Results indicate that Ridgeview Spanish Immersion’s mid-year transfer rate on average came to a mere 1.7% as compared to 12.6% for the remainder of this district’s elementary schools. Sub-question #2: How do these rates compare with the attrition rates of one demographically similar, same-district elementary school? To address this question, a match school was selected from within the district based on a similar demographic profile. Match schools were found for two of the four immersion schools, Northbrook French Immersion and Ridgeview Spanish Immersion. Withdrawal rates for these two immersion schools were then compared to those of demographically similar, non-immersion elementary schools, Hope Elementary and Phillips Elementary. Table 3 displays the mid-year transfer rates for schools in the Edwards Suburban School District. Withdrawal rates were very similar across six years, with the averaged rate indicating a slightly lower rate of withdrawal for the French immersion school. In contrast, withdrawal comparisons for Rosetown Suburban Schools found far fewer student withdrawals in the immersion school as compared to the demographically-comparable non-immersion school (see Table 4). Sub-question #3: Have the attrition rates for each school over the ten-year period remained stable, increased or decreased as each program has established itself? The total withdrawal rates for the four immersion schools over the ten-year period were examined to determine whether the attrition rates (or total withdrawal rates) for each school remained stable, increased or decreased as each program established itself. The two younger schools, Pearl Spanish Immersion and Northbrook French Immersion, which began in 1996 and 1991respectively, both showed higher total withdrawal rates during years 1 and 2 of the program (see Table 5 below for rate comparisons). However, this rate decreased steadily as the programs matured (program years 5 and 6). Sub-question #4: Are there specific grade levels during which student transfers to a non-immersion program are more likely to occur? Finally, data were analyzed to determine the timing of student transfers in each school and to establish whether there are critical periods (i.e., particular grade levels) during which students are more likely to transfer out of an immersion school. To do this, each immersion school’s percentage of total withdrawals at each grade level was determined for all available data years. Grade-level specific percentages were then averaged over the data period in order to examine which grade level(s) produced the highest overall percentage of student transfer per immersion school. Findings from these analyses were inconclusive. Over a period of six years at Northbrook French Immersion, the highest average rate of withdrawals occurred during third grade, with the next highest in first grade. At Ridgeview Spanish Immersion, data for a four-year period showed that the highest rate of withdrawals took place during kindergarten, followed by grade four. The data from Pearl and Anderson Spanish Immersion Schools, were not complete enough to do an adequate analysis. Results indicate that transfer rates for the four U.S. elementary immersion schools included in this study were either similar to or lower than same-district mobility rates and mid-year transfer rates of demographically similar, non-immersion elementary schools. These findings suggest a high level of satisfaction with the immersion option and could be utilized to promote the program in the district and in the community at large. Research-based information about attrition rates in U.S. elementary immersion schools is crucial for immersion educators. Such information provides a tangible measure of these immersion schools’ ability to provide a sustained learning experience for elementary-age students, especially after they develop beyond the start-up years. Moreover, low attrition rates in the elementary immersion school could provide impetus for district officials and parents to support continuing the immersion option into middle and high school. Upon review of the annual percentages of mid-year withdrawal for these four immersion schools, study findings seem quite positive for immersion educators and administrators. However, it should be noted that the two schools providing the most complete data (Northbrook French Immersion and Ridgeview Spanish Immersion) were both suburban schools, contexts known to be less likely to experience high attrition. Thus, this study may not accurately reflect what is occurring in urban immersion programs. Furthermore, if one follows a cohort of students from the beginning of the elementary experience through elementary-school graduation at fifth or sixth grade, it is clear that attrition remains a concern in both urban and suburban immersion schools. For example, the average attrition rate for six cohorts of K-5 students at Northbrook French Immersion was 24.7%. In other words, nearly one-fourth of the children who began in kindergarten dropped out of the program before the end of the fifth grade. Such findings indicate a need for further research into this issue. In particular, it would be valuable to explore who is choosing to leave the program and for what reasons. Complete and accurate record keeping is imperative for undertaking research of this sort. Despite great efforts to obtain student withdrawal information from a variety of sources (at the site, district and state level), there were many gaps in the information that was provided. It is thus recommended that immersion administrators encourage office staff to keep accurate and complete records on student withdrawals. When relocation is not the reason for a student’s transfer out, immersion programs will benefit if administrators or support staff conduct formal or informal exit interviews with the student’s parents. Such information is necessary to more clearly understand the reasons for student withdrawal from immersion and implement school-wide practices to address the issues. Boschung, S. & Roy, N. (1996). Issues surrounding transfer out of French immersion: A literature review. Nanaimo, Vancouver Island, Canada: U.B.C. Modern Language Department. Halsall, N. (1989). Immersion/regular program study. Nepeon, ON: Carleton Board of Education. Halsall, N. (1994). Attrition/retention of students in French immersion with particular emphasis on secondary school. The Canadian Modern Language Review, 50(2), 313-345. Hayden, H.M.R. (1988) French immersion drop-outs: Perspectives of parents, students and teachers. Reading – Canada – Lecture, 6(4), 222-235. Kamin, J. (1981). Difficulties in early French immersion: A transfer study. Unpublished mauscript, Ontario Institute for Studies in Education. Morrison, F. (1989). Transferring from the French immersion to the English program. Contact, 8(2), 3-5. Morrison, F., Pawley, C. & Bonyun, R. (1979). An examination of two cohorts of students who have transferred from primary-entry immersion programs in Ottawa and Carleton. Ottawa: Research Centre: Ottawa Board of Education. Stern, M. (1991). The French immersion transfer process: an investigation of children transferring from the French immersion program into the regular English program. Ph.D. thesis, University of Toronto, Canada. Stover, D. (November, 2000). The mobility mess of students who move. The Education Digest, 61 – 64.